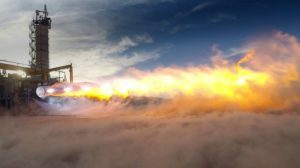 September 27, 2018 – United Launch Alliance’s (ULA) next-generation rocket – the Vulcan Centaur – is making strong progress in development and is on track for its initial flight in mid-2020. The Vulcan Centaur rocket design leverages the proven success of the Delta IV and Atlas V launch vehicles while introducing advanced technologies and innovative features. Vulcan Centaur is ULA’s next-generation, American rocket system. As a result of these agreements, the Vulcan Centaur will surpass current rocket capabilities and launch services at significantly lower costs, while still meeting the requirements of ULA’s cooperative research and development agreement with the U.S. Air Force to certify the Vulcan Centaur for national security space missions. United Launch Alliance headquarters are located in Centennial, Colorado.